Need help with my RCM motor mount. Hey guys....I picked up a motor mount from RCM about a week or so ago , but today I finally received my "black Friday " special MM 2200 system. This is only going to be a basher rig ( hence why I picked up a MM kit )....but this is the first time I've put together an 1/8th electric and the first time I have ever used an RCM motor mount. If you look at the pic below.....what am I missing? I know that the top bolt will adjust the mesh between my pinion and spur gear.....but how do I mount bolts to the other two? There is a big gap there....am I supposed to use some special bolt or something? I could use some advice....or even better yet , a pic so I know what I'm looking at. I really want to get this rig put together just to "see if I can ".....she is going to be one tough , heavy baddass SOB when I'm done with her! 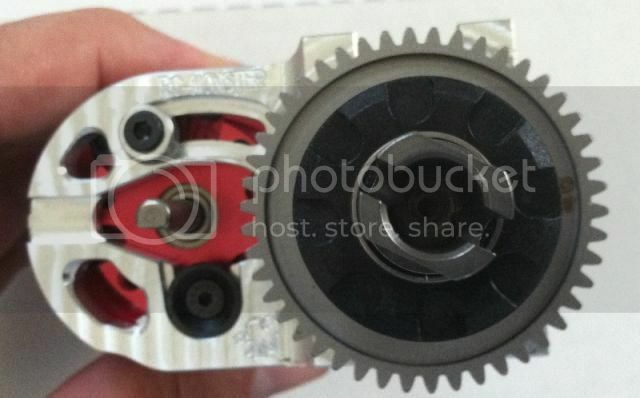 The motor only mounts with the top and bottom screws, the middle third one is not used. Only 2 screws to mount it. You should have received some other small parts with the motor mount, a black metal pivot bushing and an aluminum washer. The pivot bushing goes in the bottom and the aluminum washer is used on the adjustable top part. Oh DOH!!! .....I didn't even see those two little bushing and washers in that little bag. Now that makes sense. I was sitting there scratching my head thinking " wth?". You know I did a layout of all the parts last night on my old MBX4 and it's going to turn out even better than I had originally thought. I'm building this one from the ground up with a brand new Fioroni chassis to. I have such a huge stock pile of old MBX parts it's unreal......and now that the electric stuff is around.....I'm going to take full advantage of these old buggies. BTW....I picked up a couple MBX-6 Eco's to , because I needed something newer for the racing scene. One of them is brand spanking new I got from a guy for $325.00 , the other is a used ( but very tight ) Tekno V4 conversion in which I'm making a custom SCT out of. Got a lot on my plate right now for building......and with bringing my old MBX-4's into the mix......I should have some serious on track weaponry going! hehe. BTW.....you wouldn't happen to have pic of the RCM steering servo mount already installed would you? I haven't gotten that far into it.....and honestly didn't even know that was going to come with my motor mount. But is looks cool as hell.....and I'll be using it for sure. OH....one more thing. Any advice on how to mount an ESC? I'll have it in the back of the buggy along side the motor ( other side of the center CVA )......but wasn't sure what the best way to fasten it down to my chassis? Do people just use double sided tape? That doesn't seem all that safe to me on an 1/8th scale. I think I can handle everything else.....but wanted a good option on my ESC mounting. Last edited by JEFFRO503; 12.04.2012 at 12:06 PM. Thanks man! I have to make an order through Amain anyways...so it was perfect timing. Hey....does anyone know....can I shorten the 3 lead wires on the Mamba Monster ESC? I'd like to cut off about 3" on each one because they are so damn long. I know some ESC's you can't , as the wires are very capable of accepting solder. The stiff wires coming out of motors cannot be shortened, they are the actual windings of the motor extended out. Messing with the lengths messes with the motor. Now the motors with the floppy wires coming out are ok to shorten, the motor coils terminate in the motor itself. Just wanted to give you some background so you can answer that question yourself in the future. I just converted a mugen myself. Check out the tread in my signature. :) good luck with all your rigs!! Oh yeah.....I knew not to mess with the motor wires. I just wanted to shorten the ESC wires down a little because they are just to long. But Brain.....kind a glad you popped in here. You are using the RCM steering servo mount I see in your conversion. Would you mind pointing me in the right direction of where you got the actual mounts for the servos that go underneath the RCM mount? Actually.....that's only 1/2 my problem......even after I mount the servo to the RCM mount.....I can't figure out how to actually get it attached to the chassis. The bolt holes drilled out on the mount don't line up with anything on my chassis. I'm thinking maybe it was made for an MBX-5. Not sure on that.....but your mount looks exactly like mine. I "think" what I'll end up doing is cutting down my old servo tray to just fit my steering servo. I have to anyways because the motor sits right about where the old brake servo used to be. The servo could only go on one way for me. I just mounted the servo in the little servo bracket. Mounted the servo servo plate stands to the chassis as it says to in the manual. and the bracket went on top of those. The RCM logo is facing up. 2 screws holding it down in the rear, one in front.